Kateri, favored child and Lily of the Mohawks, I come to seek your intercession in my present need: (State your intention here...) I admire the virtues which adorned your soul: love of God and neighbor, humility, obedience, patience, purity and the spirit of sacrifice. Help me to imitate your example in my state of life. Through the goodness and mercy of God, Who has blessed you with so many graces which led you to the true faith and to a high degree of holiness, pray to God for me and help me. Obtain for me a very fervent devotion to the Holy Eucharist so that I may love Holy Mass as you did and receive Holy Communion as often as I can. Teach me also to be devoted to my crucified Savior as you were, that I may cheerfully bear my daily crosses for love of Him Who suffered so much for love of me. In Thanksgiving to God for the graces bestowed upon Kateri: (Recite the following prayers...) Our Father... Hail Mary... Glory Be... (3 times) Kateri, Lily of the Mohawks, pray for me. God the Son, Redeemer of the World have mercy on us. Holy Trinity, one God, have mercy on us.Kateri, lily of purity, pray for us. Kateri, consoler of the heart of Jesus, pray for us. Kateri, bright light for all Indians, pray for us. Kateri, courage of the afflicted, pray for us. Kateri, lover of the cross of Jesus, pray for us. 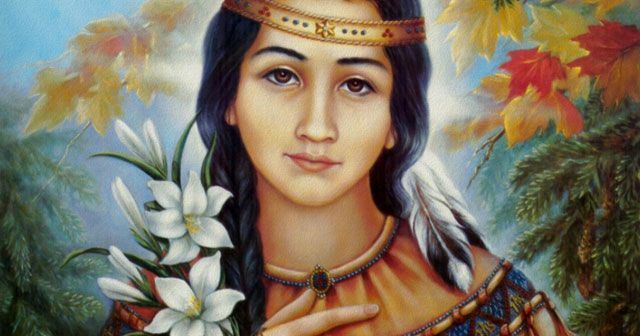 Kateri, flower of fortitude for the persecuted, pray for us. Kateri, unshakeable in temptations, pray for us. Kateri, full of patience in suffering, pray for us. Kateri, keeper of your virginity in persecutions, pray for us. Kateri, leader of many Indians to the true faith through your love for Mary, pray for us. Kateri, who loved Jesus in the Blessed Sacrament, pray for us. Kateri, lover of penance, pray for us. Kateri, who traveled many miles to learn the faith, pray for us. Kateri, steadfast in all prayer, pray for us. Kateri, who loved to pray the rosary for all people, pray for us. Kateri, example to your people in all virtues, pray for us. Kateri, humble servant to the sick, pray for us. to love Jesus and Mary, pray for us. Lamb of God, who takes away the sins of the world, spare us, 0 Lord. Lamb of God, who takes away the sins of the world, graciously hear us, 0 Lord. LET US PRAY 0 Jesus, who gave Kateri to the Indians as an example of purity, teach all men to love purity, and to console your immaculate Mother Mary through the lily, Kateri Tekakwitha, and your Holy Cross, Amen.